1. Preheat the oven to 200oC, gas mark 6. Butter 4 x 200ml dariole moulds or individual pudding basins and place on a baking tray. 2. Mix together the flour and 1 tsp sugar, rub in the butter until it resembles breadcrumbs. Mix in the egg to form a soft dough. 3. Roll out half the pastry and cut out 4 circles slightly larger than the base of the dariole moulds and 4 circles slightly larger than the tops of the moulds. Place the small circles in the base of the moulds, and chill the larger circles. 4. Roll out the remaining pastry and cut into 4 strips approximately 24 x 6cm and fit round the sides of the moulds, sealing the pastry to the base circle. Chill for 30 minutes. 5. 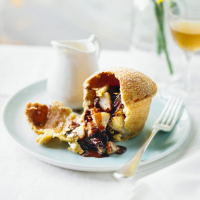 Mix together the pears, orange zest and chocolate and spoon into the pastry cases. Brush the edges of the large circles with water and place over the pear mixture, sealing the edges. Brush with milk and sprinkle with the remaining sugar. 6. Bake for 30–35 minutes until golden. Cool slightly before turning out. Serve with custard or cream. Make the pies in advance to stage 5. Follow stage 6 when you're ready. This recipe was first published in February 2017.